An oddity is a figure with binary symmetry formed by an odd number of copies of a polyform. Here are the minimal known oddities for tetrapents. Please write if you find a smaller solution or solve the unsolved case. 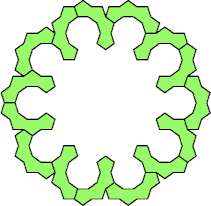 Each of these tetrapents has three cells pointing in the same direction.